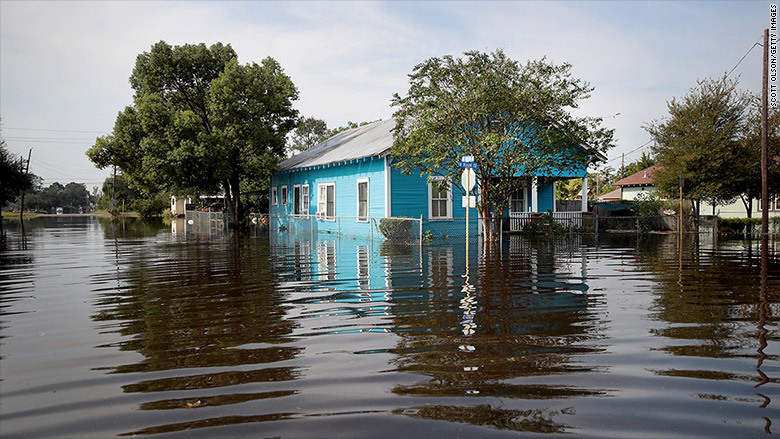 After Hurricane Harvey soaked Houston with 51 inches of rain last August, Amir Befroui, a foreclosure defense specialist at Lone Star Legal Aid, started planning for a very busy spring. That's when the 90- and 180-day break on payments that mortgage companies typically give homeowners who have been hit by unexpected events like natural disasters would start to run out. But so far, few hurricane-related foreclosure cases have been coming across his desk. "We are starting to see a trickle," Befroui says. "I suspect it's going to be a gradual increase. I don't think it's going to be a tidal wave like the one that happened after Ike." According to real estate analytics firm Attom Data Solutions, foreclosure starts in hurricane-affected areas of Texas and Florida rose in the first quarter of 2018, but still remained below pre-hurricane levels. In Houston, for example, foreclosure starts had been slightly elevated due to the oil price crash of 2015 and 2016. Not counting a dip at the end of 2017, the first quarter was as low as it's been in more than 12 years, with 1,184 foreclosure starts. That's a big difference from Hurricane Ike in late 2008, where the storm exacerbated a mounting economic crisis that spurred 7,280 foreclosure starts in just one quarter. 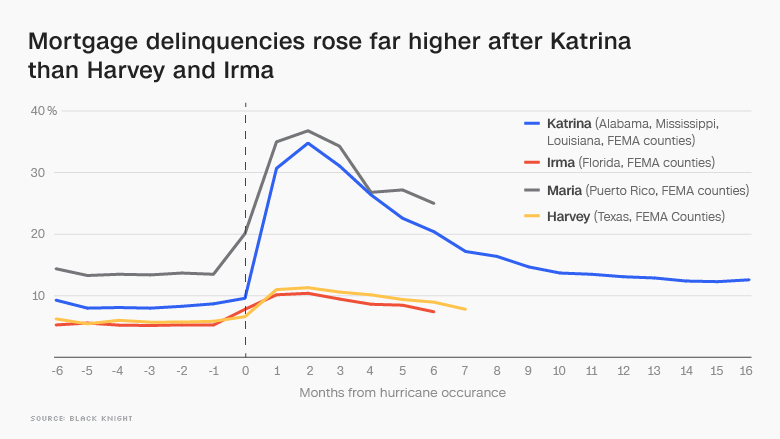 Even more encouraging, the number of people seriously delinquent on their loans in hurricane-affected areas of Texas and Florida continued to sink after spiking over the winter. Thousands of people were able to bring their mortgages current again after taking advantage of post-storm forbearances from their lenders. Given how damaging foreclosures can be for property values, credit scores and community stability, it appears the Gulf Coast has managed to dodge a potential hurricane housing disaster. At least, so far. Part of that is due to coordinated efforts by industry groups and consumer advocates who helped create better options for homeowners to modify their loans after the break on mortgage payments ends. But more importantly, reforms to mortgage policies following the financial crisis had already fostered a healthier housing market to begin with. Homeowners went into last year's disasters in a better place financially than they were during Hurricanes Ike, which hit in 2008, Sandy in 2012, and even Katrina in 2005. The irresponsible lending practices of the late 1990s and 2000s had largely been ended by the Dodd-Frank Act and the Consumer Financial Protection Bureau, which raised standards for mortgage underwriting and implemented protections for borrowers facing foreclosure. "People who've gotten mortgages post-CFPB, they don't have loans for the most part that economically they could never have afforded," says Ira Rheingold, executive director of the National Association of Consumer Advocates. Across the United States, the number of properties in active foreclosure fell in March to the lowest level since late 2006, according to the real estate data firm Black Knight. But in the case of natural disasters, programs aimed at helping distressed homeowners aren't always helpful enough. Mortgage modification programs administered by Fannie Mae, Freddie Mac, Ginnie Mae, the Veterans Administration, and the Federal Housing Administration — which now back about 70% of the U.S. housing market — require lots of documentation that's hard to pull together if your home is literally underwater. A Houston home flooded after Hurricane Harvey hit. 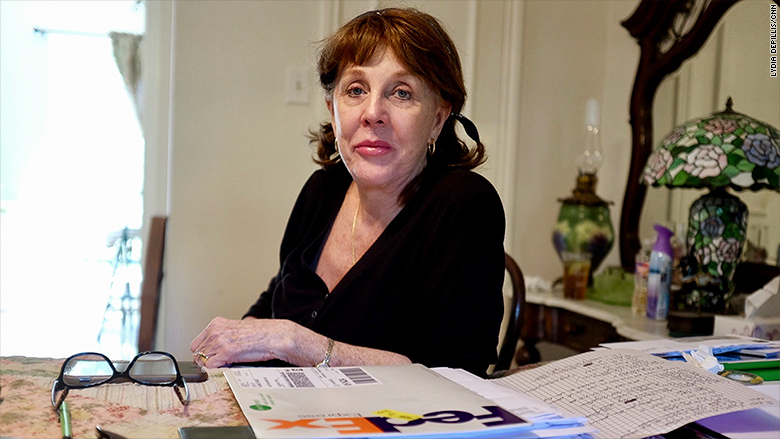 Homeowners were snarled in endless paperwork after Hurricane Sandy hit in 2012, with each government housing agency requiring different policies and homeowners owing balloon payments that came due immediately once the forbearance period ended. So as the 2017 hurricane season got started in earnest, D.C.'s housing finance wonks came to government agencies with one fundamental ask: Design a uniform option that can give homeowners a break on their mortgages without getting them in trouble when the bills come due. "We were unsuccessful during Sandy," says Meg Burns, a former Department of Housing and Urban Development official who now heads housing policy at the Financial Services Roundtable, which represents lenders and servicers. "That's what informed our thinking to get all of the government entities around the table to make some consistent policy." Along with automatic forbearances for homeowners in hurricane-affected areas, Fannie, Freddie and the FHA came up with an option that allows borrowers to make the payments they skipped during the months after the disaster at the very end of the loan — without going through a modification that could force them to take on a higher interest rate. "It's a different world now," says Sara Singhas, associate regulatory counsel at the Mortgage Bankers Association, referring to the recent departure from rock-bottom interest rates. "Especially for people who are performing on their loans, we wanted to make sure we don't put them into a worse financial position than they were prior to the disaster." These provisions, however, are only temporary and will sunset if they aren't renewed. "I would feel a lot better if they codified what we did," says Peter Muriungi, head of mortgage servicing for Chase Bank, which had 450,000 customers affected by the 2017 storms. On the ground, housing counselors say that lenders have been more willing to work with people who can prove they have been a victim of a hurricane. That kind of patience is not typically afforded to people facing foreclosure for economic reasons, such as spiking property taxes, which have become more of a problem in the Houston area in recent years. "The large national servicers, once they get it into their head that this is a Harvey case, then it gets moved over to the disaster recovery center rather than the traditional foreclosure side," says Sherrie Young, executive director of the Credit Coalition in Houston. Maurine Howard has struggled to keep her mortgage payments from ballooning after her home was damaged during Harvey. But not everybody takes action in time to receive that kind of assistance, and not everybody qualifies when they do. For those who lost jobs as a consequence of the hurricanes or were already behind on their payments before disaster struck, options start to narrow. That's why thousands of people are still facing the prospect of losing their homes, and many more could run into that situation as banks lose patience in the coming months. Aid groups worry about the people who haven't yet asked for help. "I think the biggest problem lies with the folks who don't reach out," says Glenda Kizzee, a housing counselor at the Houston Area Urban League. "They're going to utilize whatever resources they have to rebuild the home, and sometimes miss the payment on the home, which is just going to make it worse. By that time, our resources are limited in what we can do." The biggest headaches, counselors say, arise with smaller servicers that have fewer resources to work with homeowners in trouble. Take Maurine Howard, whose stately home near Addicks and Barker reservoirs in Houston was inundated when the Army Corps of Engineers released the floodgates in order to avoid a breach. She paid off the three months of mortgage payments after her forbearance ended, but the mortgage company still bumped up her monthly payment from about $1,350 to $1,700. Months of phone calls, she says, still haven't managed to fix the problem, while she racks up credit card debt to make fixes on the house. "Through the process of Harvey, dealing with the mortgage company has been a nightmare," Howard says, amid stacks of paper laid out on a bed in one of the few undamaged rooms of the house. "It's never ending. You take two steps forward and five steps back."